Although I'm slightly concerned it could be one of those stings where they lure you in with the promise of prizes, and then arrest you for crimes against humanity. So I'm sending Lisa in my place. At worst, she'll get twenty years, and be out in ten with good behaviour. If it's genuine, however, then she'll never compete with the good behaviour of our daughter. 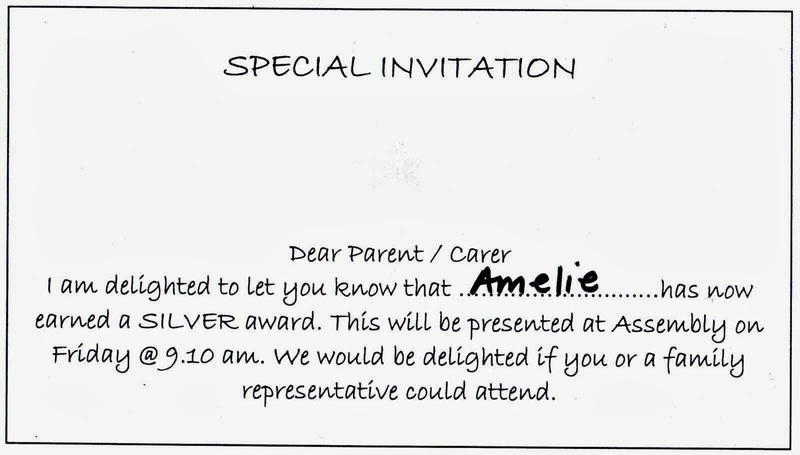 According to Amelie, who's generally about as reliable as a Wikipedia entry, Silver Awards are presented for outstanding adherence to the school's six Golden Rules. So why they're not called Gold Awards, I have no idea. 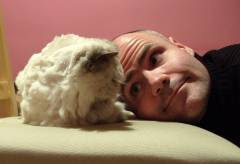 We say sorry and we forgive. Which is interesting because at home she talks back, doesn't listen to a word we say, lies through her teeth, shoves Toby around, doesn't apologise, holds grudges, and leaves the place looking like a tip. But clearly at school she's an absolute angel. Which is a pretty good argument for 24-hour boarding. 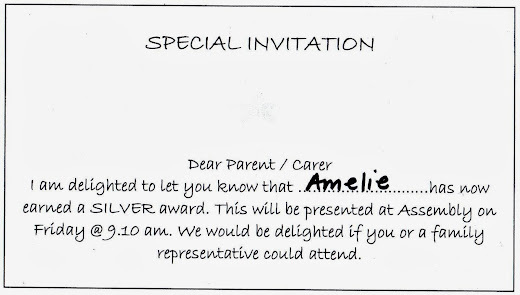 According to the school newsletter, only 26 children across the entire school won a Silver Award in September, which puts Amelie amongst the top 12% for behaviour, and should ensure that she's endlessly bullied for being a swot. Which is probably why they want us there on Friday - to break up any fights. Fortunately music soothes the savage beast, and as her last award proved, she can sing. So that should be enough to keep the thugs at bay. Let's face it, football fans are always singing, and you never get any punch-ups on the terraces. I think you'd rather have it that way round - that, if there's going to be any bad behaviour, it happens out of the public eye! HAPPY BIRTHDAY, AM!